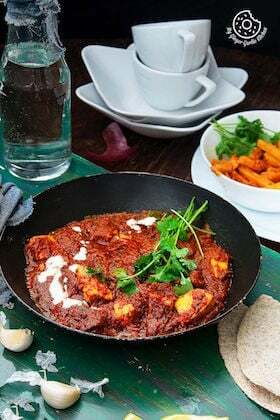 Black Chana Kadhi or Kala chana Kadhi is a chickpea flour based spicy and thick yogurt curry, made with dried black chickpea. 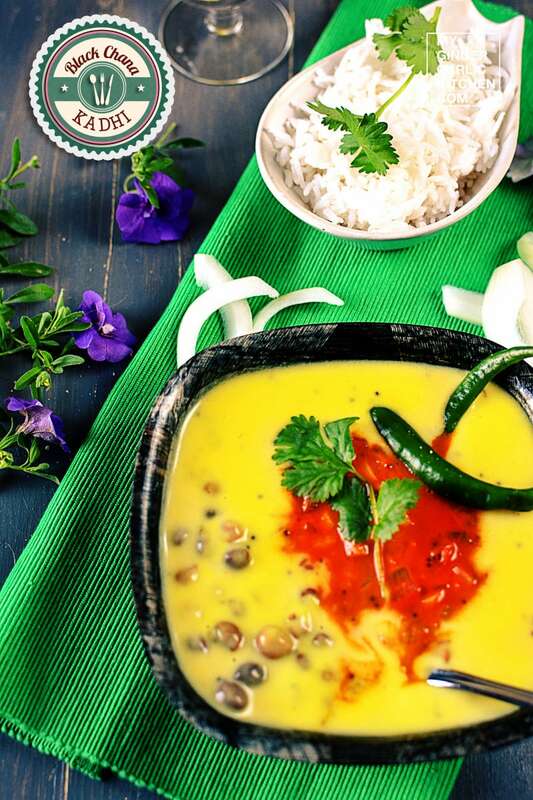 What is Black Chana Kadhi? Black Chana Kadhi or Kala chana Kadhi is a chickpea flour based spicy curry, made with dried black chickpea. This is a traditional specialty of Rajasthani cuisine (India). Kala chana kadhi/Black Chana Kadhi aka Jaislmeri Chane is a very simple, easy and quick side dish. 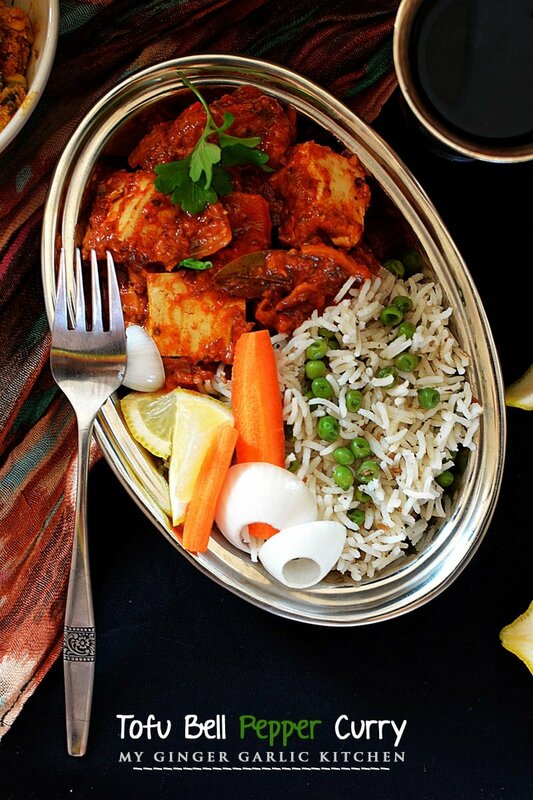 This gluten-free curry is very nutritious and full of good health. This humble dish can be served with steamed rice, and chapati. 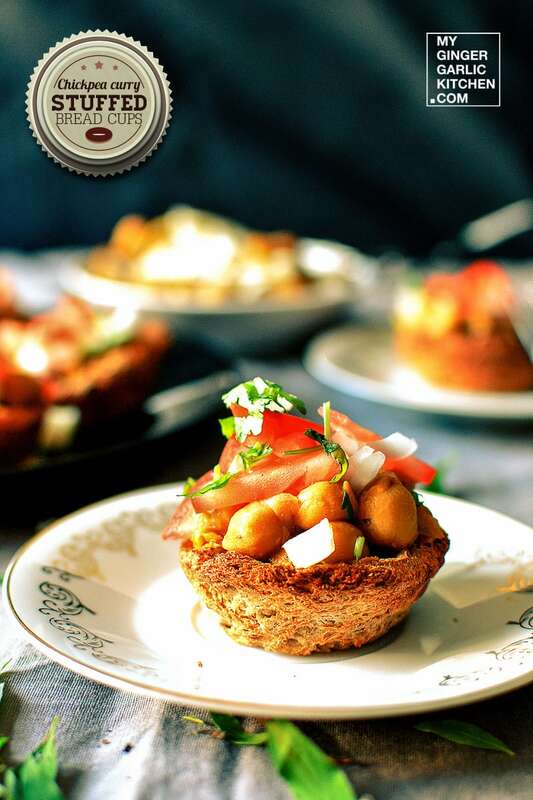 This is one of the tastiest Black chana dish, which tastes wonderful. 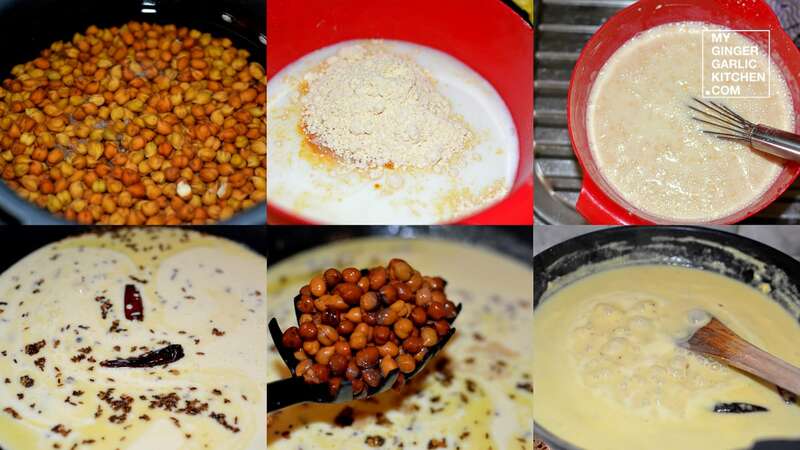 Let’s learn to cook Black Chana Kadhi in easy to understand quick steps. Discard water from the soaked chickpeas and wash again. Transfer soaked chana in a pressure cooker, and add 1 ½ cups of water. Cover the lid and cook it for 4-5 whistles. Remove from heat and set aside. Let the presser cool off. Add yogurt, chickpea flour, turmeric powder, water, salt to a large mixing bowl and whisk well to make a batter without lumps. Heat 1 tbsp oil in a pan on medium heat. 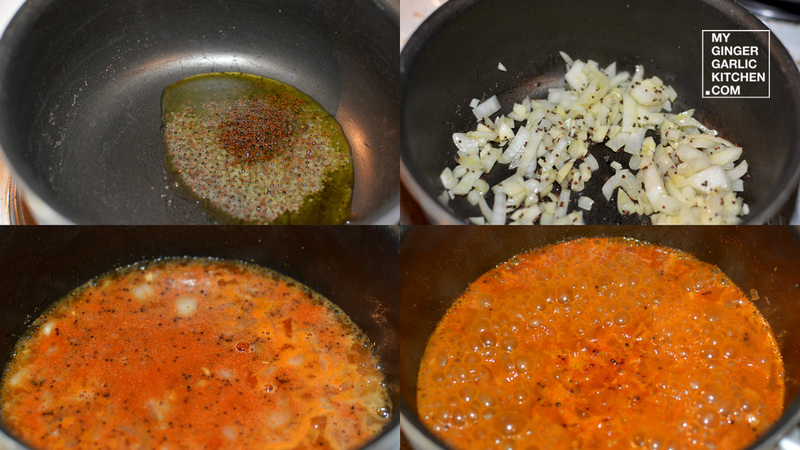 Add mustard seeds, dried red chilies, fenugreek seeds, and asafetida. When the seeds start to crackle add yogurt mixture to it and mix well. Stir continuously until it boils. Now add boiled chana and, mix well. Let it cook on low heat for about 30 minutes. Remove from heat. Heat 2 tsp oil in a pan. Add mustard seeds to it. When the seeds start to crackle, add chopped onions, and chopped garlic to it. Saute for 3 minutes. Add red chili powder with 1/4 cup water to it. Let it boil for 2 minutes. Remove from heat. 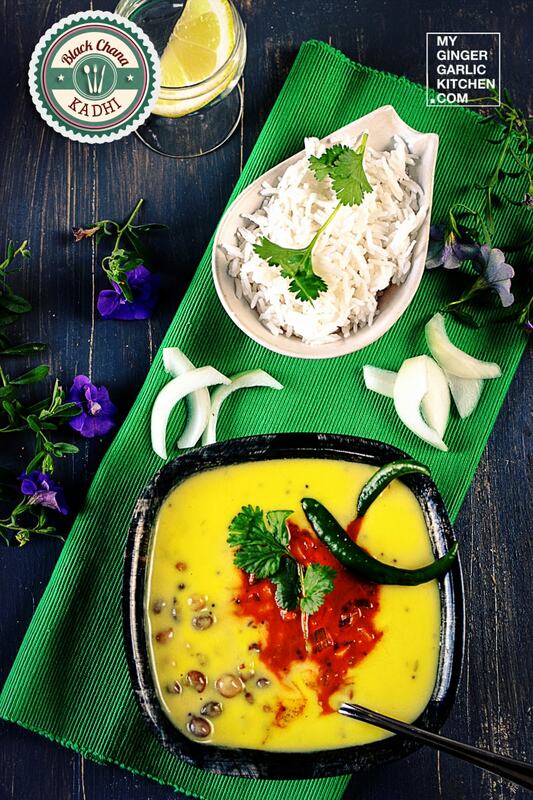 Pour this tempering over cooked chana kadhi. Black Chana Kadhi is a chickpea flour based spicy & thick yogurt curry, made with dried black chickpea. This is a traditional speciality of Rajasthani cuisine (India). Discard water from the soaked chickpeas and wash again. Transfer soaked chana in a pressure cooker, and add 1 ½ cups of water. Cover the lid and cook it for 4-5 whistles. Remove from heat and set aside. Let the presser cool off. Add yogurt, chickpea flour, turmeric powder, water, salt to a large mixing bowl and whisk well to make a batter without lumps. Heat 1 tbsp oil in a pan on medium heat. 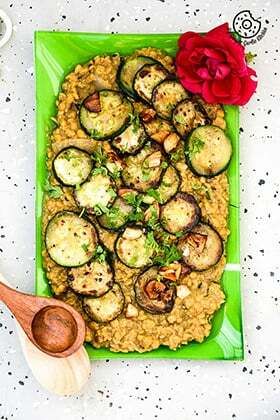 Add mustard seeds, dried red chilies, fenugreek seeds, and asafetida. When the seeds start to crackle add yogurt mixture to it and mix well. Stir continuously until it boils. Now add boiled chana and, mix well. Let it cook on low heat for about 30 minutes. Remove from heat. Heat 2 tsp oil in a pan. Add mustard seeds to it. When the seeds start to crackle, add chopped onions, and chopped garlic to it. Saute for 3 minutes. Add red chili powder with ¼ cup water to it. Let it boil for 2 minutes. Remove from heat. 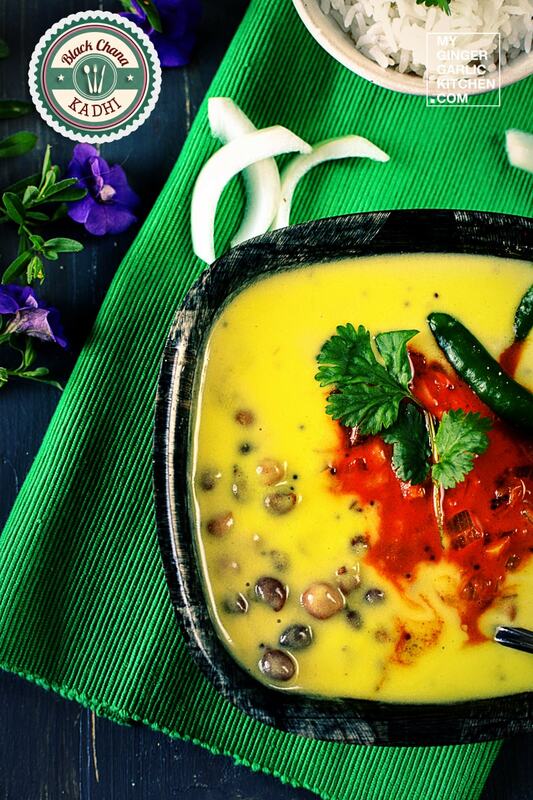 Pour this tempering over cooked chana kadhi. Serve with hot steamed rice and enjoy!